Smartphone industry is currently a weird poker game: the first to fold wins. There has been buzz around foldable phones for years. Samsung first teased it in 2014 and has since been dropping hints about it. However until recently, it seemed to be more like a concept phone that will be feasible in the future. This all changed a week ago. 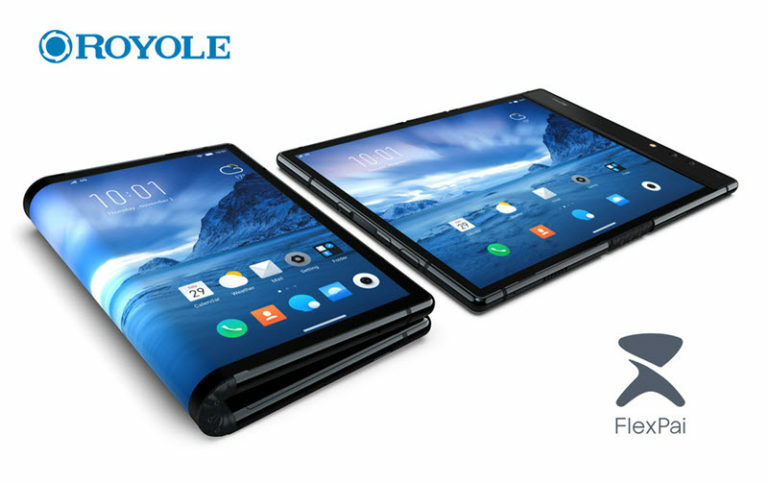 A relatively unknown startup, Royole, revealed the world’s first commercially available foldable phone. Royole beat the Korean giant, Samsung, to the punch. Few days after Royole’s announcement, Samsung showed a working flexible phone prototype during its developer conference. But it’s not just Samsung: LG, Huawei and ZTE are all reported to have a foldable phone in the works. Some are even reported to have plan for a commercial release in 2019. With foldable phones gaining massive press coverage and consumers worldwide eager to get their hands on such a device, they could potentially replace bezel-less displays as the major industry trend. However, many also express scepticism regarding the maturity of the technology, the value these devices can add to the end user and the price tag that could come with them. In this blog post, we will argue for both sides. First up, we will make the case for foldable smartphones and then express the fears regarding this technology and its potential drawbacks. After reading this blog post, it will be up to you to decide if flexible smartphones live up to the hype! Engineers have certainly put a lot of hard work into achieving a truly foldable smartphone for users to reap their benefits. What are their benefits, you ask? Let’s see. The first obvious advantage that foldable phones will have over traditional smartphones has to do with screen real estate. When smartphones got mature enough, we started consuming content we normally would on our computers, on them. Smartphone manufacturers adapted to this behavior by providing options with bigger screen sizes. Consumers loved this trend. In fact, they loved it so much that screen size has almost doubled over the past 10 years. For example when first introduced, the iPhone 3GS featured a 3.5” screen in 2009, while the iPhone XS and iPhone XS Max come in 5.8” and 6.5” respectively (2018). But this trend comes with a drawback. Even though customers love big screen sizes, they hate large devices. That’s why manufacturers tried reducing the bezels so that they could cram bigger screen sizes in the same device footprint. Bezel-less is the current trend; foldable could be the future. Foldable screens give the ability to essentially double the screen size, keeping the same footprint! Samsung’s foldable prototype certainly offers a lot of screen. We all have broken our smartphone screen at some point in our lives. If the screen is able to bend without breaking, it also should be able to withstand falls without breaking, right? Exactly! With foldables, broken screens will be a much rarer incident. 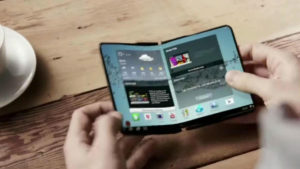 To be able to fold, the touchscreen module will consist of flexible materials that can absorb forces without breaking. Instead, they will just flex. To be able to flex, the touchscreen will be covered with plastic instead of glass. Plastic can be durable enough to withstand scratches and flexible enough to be folded. With the price tag expected to be hefty, at least for the first generation of foldable phones, this ability can give customers some reassurance that their money won’t be wasted if they drop their phones. In short, it will break your wallet upon purchase, but not your heart upon impact. Keep it folded in your pocket and it’s a smartphone. You can take photos, get calls, browse the internet and do everything you normally would on your smartphone. Unfold it and you have a tablet! You can be more productive in a tablet. Foldable phones will double as tablets (there’s even a term for that: phablets). Phablets can be a precious productivity tool, especially if you are constantly on the go. It would make sense to market foldable phones as business smartphones. Certainly, the market is there and customers are willing to spend big money for business phones (see Samsung Note 9). The first gen of foldables will likely cost more than the Note 9, but they will also have more to offer. Just before Samsung teased its foldable phone, Google came out and said that Android will natively support foldable phones. The version of Android that will be developed for foldables will support up to 3 apps running simultaneously! Having a tablet-sized screen on your smartphone and the ability to run 3 apps at once can unlock an unprecedented level of productivity to the user. And if you want to unwind after a serious session of on-the-go productivity, chilling on Netflix or gaming can be more enjoyable on a big screen, right? Many people are sceptical as to what the foldables have to offer. Here is where their scepticism stems from. Will foldables be reliable enough? This is a major concern for potential buyers and rightly so. Foldables will be expensive: Royole’s foldable phone will start at $1,469, Samsung’s Galaxy F will likely cost more than $1,700. Needless to say, with great price come great expectations. Spending that kind of money on a smartphone that turns out to be unreliable can potentially damage the reputation of foldables, or even the brands that will get them to market. First generation devices are always buggy – to some extent at least. With foldables, this risk is greater. Both hardware and software are making their debut with these devices. Hardware-wise, there are doubts about the touchscreen’s performance. The main area of concern is where the device folds. That is the most critical aspect of the design. Will touches register properly at that area? Will it be bright enough? And will it be able to withstand the wear that comes with folding/unfolding actions? Software is brand new too. Google just announced its support for foldables with exclusive features. New software features are often buggy. Will developers manage to iron them out before distribution? Apart from the hefty price tag, don’t forget the nature of the end users. If foldables are marketed as flagship business phones, then the targeted users will expect successfully perform business tasks on them. Trying to perform business tasks on an unreliable phone will be a deal-breaker for many. Creating a working prototype of a foldable phone is one thing. Manufacturing thousands of them and shipping them is a whole other thing with many more complications. 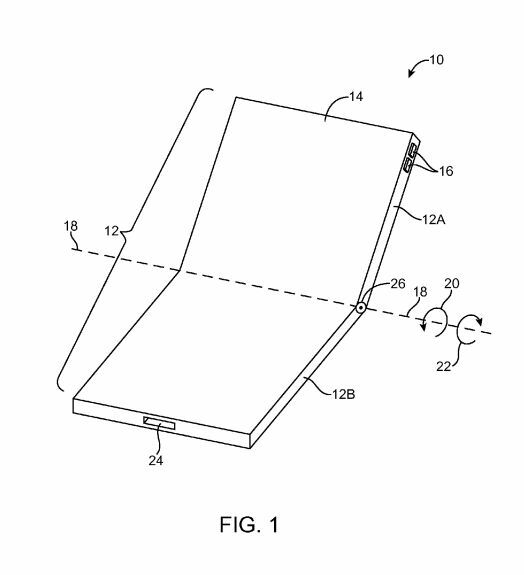 Foldable screen prototypes have made their appearance a few times in trade-shows. However they were just for show. What’s different this time around is that both Royole and Samsung are willing to mass produce these phones. Mass producing foldables likely means reforming the supply chain and adopting new manufacturing techniques. These changes cost a vast amount of money and have been the main barrier for integrating foldable screens in consumer products until now. To lift this barrier, Royole has invested $1.2B in production facilities to make this technology readily available. The most obvious change is in the touchscreen. Indium Tin Oxide (ITO) has been used in the majority of touchscreens so far. However, it can’t bend, so an ITO alternative will be needed. Reports claim that either Metal Mesh or Silver Nanowires will be used in foldables. Both of these materials require different processes than ITO. Research study by Fieldscale & PolyIC about the performance of a Double-Layer PCAP Metal Mesh touch screen compared to a similar made of ITO. The screen isn’t the only thing that will change: batteries and the enclosure of the phone may also need to fold and the hinge between the screen will need to be manufactured. All these changes will probably mean new processes and new machinery. Due to their nature of being new, they can add uncertainty to the design process and drive the product’s price up. Connecting those new components will be a complex challenge. Smartphone developers seem overly ambitious. Samsung’s prototype featured 3 working screens, something unprecedented in the industry. Ambitions and not mature enough technology can lead to extra levels of complexity, leaving a lot of details that could potentially fail, especially if the product is rushed. The screen cover on foldables will most likely be made of plastic, since glass can’t bend as easily as plastic. This might displease some potential buyers: if you spend more than $1,400 on a phone, you would expect a premium feel and build. Plastic feels cheaper and is currently used in low-end phones. The prototypes that we got a glimpse on also looked bulky and definitely not premium. Hopefully, the final designs will be more refined and good looking. With a lot of extra components in foldables, weight might be an issue too. We are used to smartphones being lighter every year. 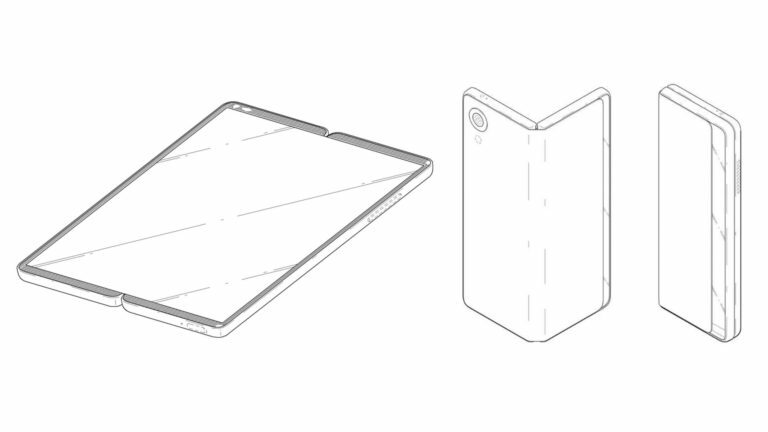 A heavy foldable phone might alienate some users. Foldables are officially here. Next year, we’ll probably see more companies joining the foldable race and more specs of the unveiled designs will be made public. Will they become the next big thing of the smartphone industry? It’s hard to tell. One thing is for certain, though. The industry had stagnated a bit. Even Apple’s and Samsung’s latest flagships were just incremental updates over their predecessors. All the available devices pretty much look the same and innovation has been focused on just minimizing the notch. Consumers have lost their excitement due to the lack of innovation and this translated in sales volumes that failed to impress investors and analysts. With a lot of major players having joined the race for foldables, this already have accomplished one thing: sparking innovation again in the industry. Consumers again seem hyped and excited about the future the industry is heading towards. Are foldables here to stay? We’ll see how this story… unfolds.